Inside Amanora Mall, in the East Block, there’s a new bar that will transport you to Hawaii. Well, not literally! 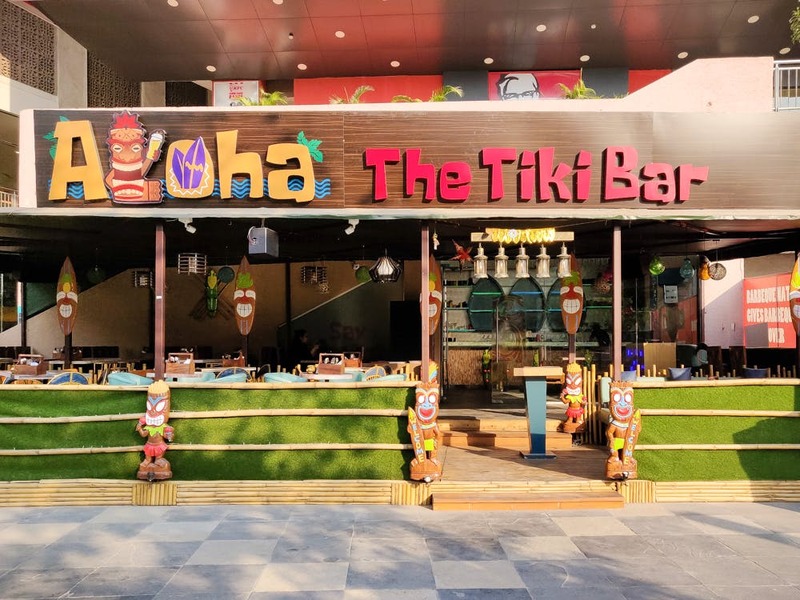 But the vibe at Aloha - The Tiki Bar is relaxed, colourful and is the perfect place to come with close friends for a drink. The patio looks out to a lot of green. It’s location is apt in a mall where it’s quite easy to get lost. And most of their seating is outdoors, but the area is completely roofed. Inside is a colourful bar, with boat shaped shelves that wait for an alcohol license to be stocked up. The overall decor is quite apt with tiki masks adorning walls and chairs that have tiki faces painted on them. The seating is mostly for groups and tall stools help you look out and people-watch too. We’re confused with why every light fixture is a bit different than the next, but it’s easy to ignore. But, the decor of the bar area is our favourite space! We’ll only get to say aloha to alcohol later, so we settle for a pomme mixito, a pomegranate mocktail that’s refreshing in the middle of the day. The food menu is a mix of everything from appetisers that include the likes of jalapeno poppers to korean fried chicken to a variety of kebabs. Mains include burgers, pizzas and other usual Indian combos like butter chicken and naan or manchurian and rice. A meal for two will cost you INR 800 to INR 1,000 without alcohol. We’re hoping they get their license soon and we can’t wait to see if there’ll be a Hawaiian twist to the cocktails being poured. We would have loved to see some Hawaiian-inspired food on the menu. Perhaps, some poke bowls would be great for a light lunch on the patio. Enjoy the theme here. They’ve done a great job on the look of the space and the food and drinks taste great too.